I finally reached my tipping point and frogged International Bright Young Thing. When I took it off the needles, the biggest infraction was the double-knitting, which affected the border due to halving the number of stitches because I wanted only yarn A on the outside. 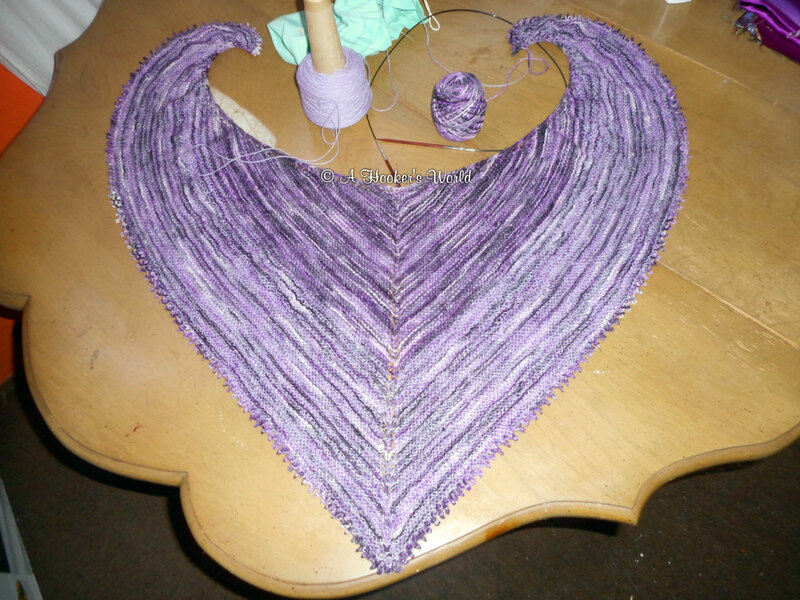 While the shawl was on the needles, I could not see the lavender, which is clearly seen in this picture. Finally, I did not know how big the shawl was. My original goal was 600 stitches; I ended up at 400. I think I am going to try it again, but using a rib or stockinette – despite my loathing of blocking – to try and disrupt the striping more, and remove the lavender, which I can use with a darker lavender for the next shawl, which must be crocheted!